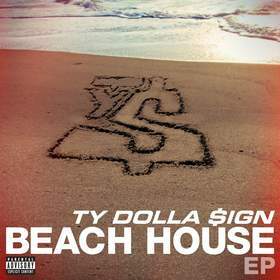 NEW YORK, NY--(Marketwired - Jan 21, 2014) - Atlantic recording artist Ty Dolla $ign has set a jam-packed schedule in celebration of this week's release of his highly anticipated major label debut, "BEACH HOUSE EP." "BEACH HOUSE EP" -- which includes the hit single, "Paranoid (feat. B.o.B)" -- arrives at all DSPs and select music retailers today. Purchase "Beach House EP" on iTunes now: http://smarturl.it/BeachHouseEP. Ty is set to kick things off tonight with a release day event at Los Angeles' Supper Club, followed tomorrow, January 22nd, by a much anticipated "Hot 97 Who's Next" headline performance all the way across the continent at New York City's famed S.O.B. 's, and a performance of "Paranoid" on BET's 106 & Park on Friday (check local listings.) Additional live shows are lined up through March, including a full slate of showcase performances at the upcoming South By Southwest Music Festival (SXSW) -- for complete details, please see www.dollasignworld.com/tour. "BEACH HOUSE EP" is highlighted by the DJ Mustard-produced hit single, "Paranoid (feat. B.o.B)," which has proven a top 20 favorite on the iTunes Store's "Top Hip-Hop/Rap Songs" chart as well as multi-format radio outlets across the country. In addition, the "Paranoid" companion video -- directed by Ethan Lader (Bruno Mars, Travie McCoy, B.o.B, OneRepublic) -- has over 4.2 million views and is streaming now at Ty's official YouTube channel at: www.youtube.com/tydollasign. What's more, the "Paranoid" video recently kicked off the premiere episode of The Gates of REVOLT, the Diddy-hosted new hip-hop video series featured on the recently launched REVOLT network. "BEACH HOUSE EP" sees Ty collaborating with a number of top hip-hop stars and studio wizards, including Wiz Khalifa, Trey Songz, French Montana, Travi$ Scott, Fredo Santana, Casey Veggies, with production from Young Chop, DJ Mustard and even Ty himself. Additionally, the 7-song collection features additional production contributions from buzzed-about violinist and string arranger, Peter Lee Johnson. The EP follows the L.A.-based singer/songwriter/producer's critically-acclaimed breakthrough mixtapes, "BEACH HOUSE" and "BEACH HOUSE 2," the former acclaimed by Pitchfork for its "dense, immersive production" and "(Ty's) voice: a syrupy tenor that can contract into taut staccato sing-rap or spread out into drippy vocal runs at a moment's notice." Born Tyrone Griffin, Ty Dolla $ign has been an in-demand writer, producer, and featured artist since helming YG's 2010 smash, "Toot It and Boot It (feat. Ty Dolla $ign)," going on to work with the likes of Trey Songz ("Fumble"), B.o.B ("HeadBand feat. 2Chainz") and Wiz Khalifa and Snoop Dogg ("Young, Wild & Free feat. Bruno Mars"). The latter went on to be nominated for "Best Rap Song" at the 55th Annual Grammy Awards. The music from Ty's production team D.R.U.G.S. (Dirty Rotten Underground Sound) dominated the airwaves in 2013. This new era of L.A. bred producers & musicians -- including DJ Mustard, Ty Dolla $ign, Nate3D, Chordz and James Koo -- redefined the sound of west coast hip-hop with heavy 808's and a greedy snap. A series of increasingly hot mixtapes earned him further attention, as did such anthemic singles as "Irie (feat. Wiz Khalifa)" and "My Cabana (feat. Young Jeezy)," which was named one of Complex's "50 Best Singles of 2012." As if that weren't enough, the gifted singer/songwriter/multi-instrumentalist is featured on such current singles as Bone Thugs-N-Harmony's "Everything 100 (feat. Ty Dolla $ign)." For additional news and information, please visit: www.dollasignworld.com, www.facebook.com/tydollasign, https://twitter.com/tydollasign, and http://instagram.com/thedollasign. For press materials, please visit: http://press.atlanticrecords.com/ty-dolla-ign.